I love the green things in your bento, Lia..
@Angi : Thanks Angi ... I seldom give my kids chocolate but they got an exception for today. @mushima hawani : thanks Wani! if only my bento is as gorgeous as yours, I wonder if that would make me concentrate harder at work and get excited towards lunch time ha ha. lia the kamakobo bears are soooo cute, did you get at your local market? 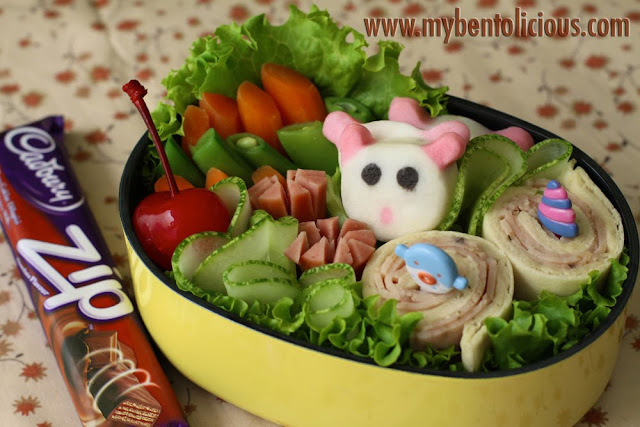 this is another wonderful little bento, i love it! another lovely bento, love your idea on the thin cucumber - well done!